There is nothing more important than a good, safe and secure house. This fortifying thing needs to be taken well care off. As the house faces different natural forces, it tends to be a cushion for the people who live within. It faces deadliest heat waves, bone freezing cold, rains, and storms. But the effects are minimized by the exterior portion of the house, i.e. siding, the strongest and most durable portion. It adds years to the house. With the advancement in the technology and manufacturing, siding material has improved considerably well. Today even with the strongest material the house can be made beautiful contrary to the previous ages. One has to wisely choose the material for siding keeping in mind the cost and weather conditions. Various materials for siding are wood, fiber cement, bricks vinyl, shingles and metals. Bricks require the least maintenance, too comes in various shapes, size and color. Bricks are the most commonly used siding material. Similar to bricks, stones are also a good option to be used as siding. Wood is used in the form of flat boards or strips. The texture of wood is known worldwide. The key point while using wood as siding material is to have waterproof membrane behind the wood strips or boards. Fiber sheet comes in the form of panels of different size. Shingles are available in the form of fiber cement and vinyl. These are available in different shapes also. Although metal is not widely used, but in can be used accordingly such as in case of copper, it requires the minimum maintenance. The siding for houses cost depends on many factors. It should be installed easily. Should be durable and strong enough to resist all weather forces. Adds up to the look of house. Wood, with the availability of desired wood, it seems to be one of the most expensive types of siding material. The price goes up as the wood type and quality flourishes. Fiber cement panels costs with respect to their size and thickness. Generally they come in the form of 4feet by 6 feet and 4feet by 8feet panels. They cost between 6$ to 14$. Bricks high durability and the fact that it has minimum maintenance marks its cost, due to this the cost increases. The higher the quality and shade of brick higher is the cost. It is expected to be 13$ to 18$. Similarly stones also have the least maintenance and they cost on the higher side, estimated to 32$ to 55$ depending on the texture and type of stone. Metal cost varies with the use of metal, its strength and the craftsmen working on it, too the installation charges are also included. So it is better to go through the market before opting for this type of siding. Vinyl siding, with its easy installation and large availability, the price decreases. In modern construction and lookalike structure-texture of natural siding material, vinyl siding is largely used. The history of vinyl is quite old as it came into existence in the early 50’s, since it was not so easy to use it wisely. But today in the fast pacing construction and with a demand of a cost effective, low maintenance and high durable material vinyl sidings are used. They are used in a number of ways such as replicating a natural stone like structure or texture, replicating wooden frames, glossiness, imitating vintage looks. With the ease of manufacturing and production, being cost effective, ability to replicate wood, metal or different siding materials vinyl sidings are used in new construction of buildings and houses on a large scale. 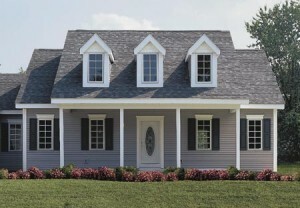 We have laid a portrait of the best siding for houses, their types and the cost they bear. But before opting a siding for our beloved house one should consult a professional. Separately we have discussed the general information about vinyl sidings such as their quality and in what areas they can be used. Siding products for houses must be chosen with care.